Soup, soup, beautiful bead soup! 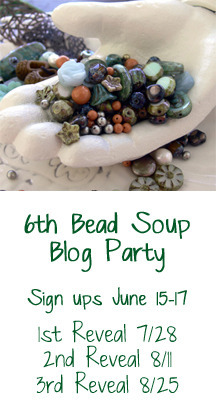 The Bead Soup Blog Party has begun, with the exchange of bead soups! Denise got hers early last week while mine showed up at the end of the week. And I have to say, I think we were both quite chuffed with what we got. Denise sent me a lovely selection of beads, inspired by my name, Melissa, which means honey or honey bee in Greek. 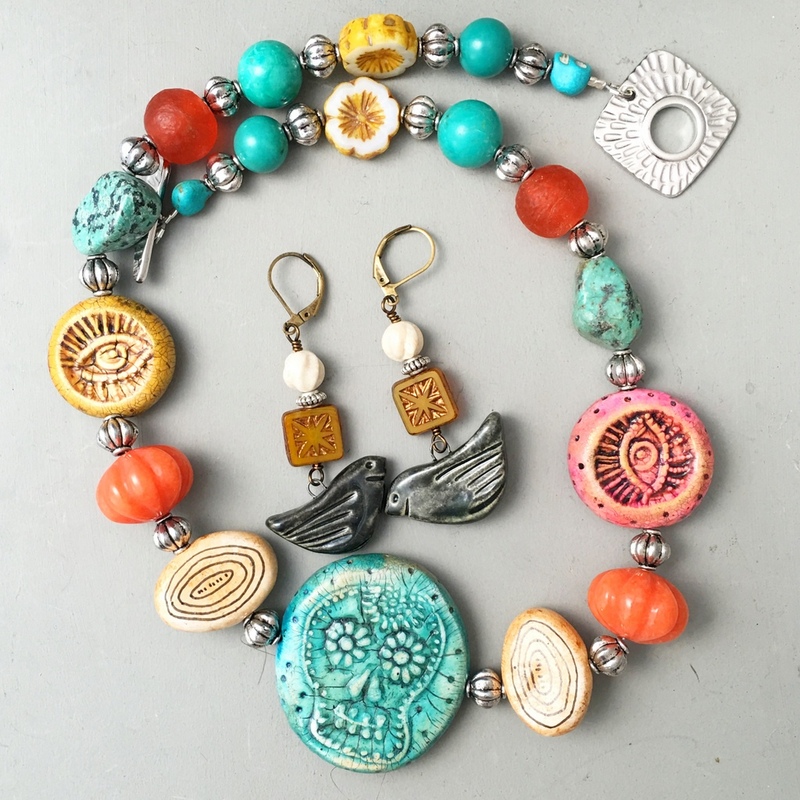 The beads span a palette of delicate oranges and yellows as well as earthy tones, plus a set of turquoise blue turtles for contrast. The beads include carnelian, coral, dyed agates and jasper, to set off two gorgeous stone focals, one a larged striped agate and the other a mustard-coloured agate, She threw in some of her favourite one- and two-holed beads and another small beadwoven focal that I think she made. 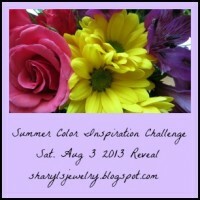 The colours remind me of the Australian desert landscapes, which may lead me to some inspiration! 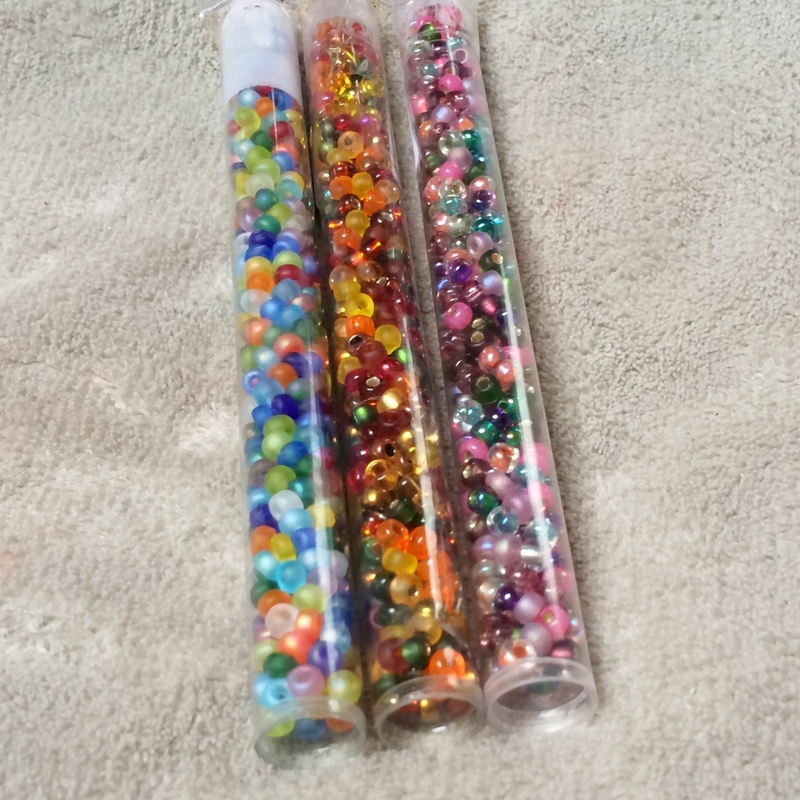 As to the beads I sent Denise, well, they had an Australian flavour of sorts. 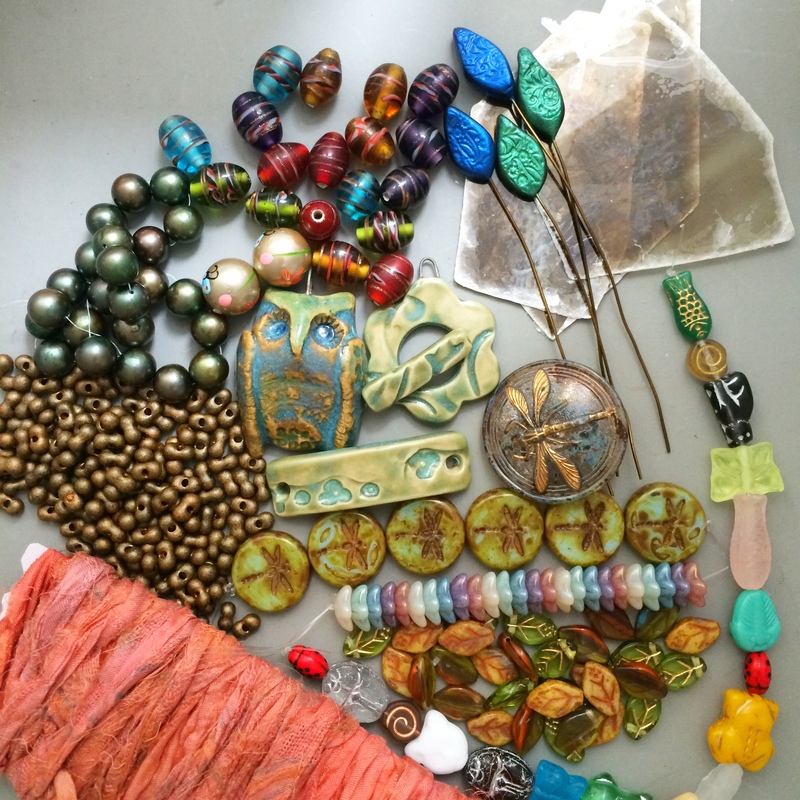 I picked beads by some of my favourite Australian beadmakers, including a big beautiful ceramic focal by Natali Fletcher-Jones, that I have been hoarding for a while, plus some earring charms by Melissa Gabelle, another local clay artist whose work I tend to squirrel away. 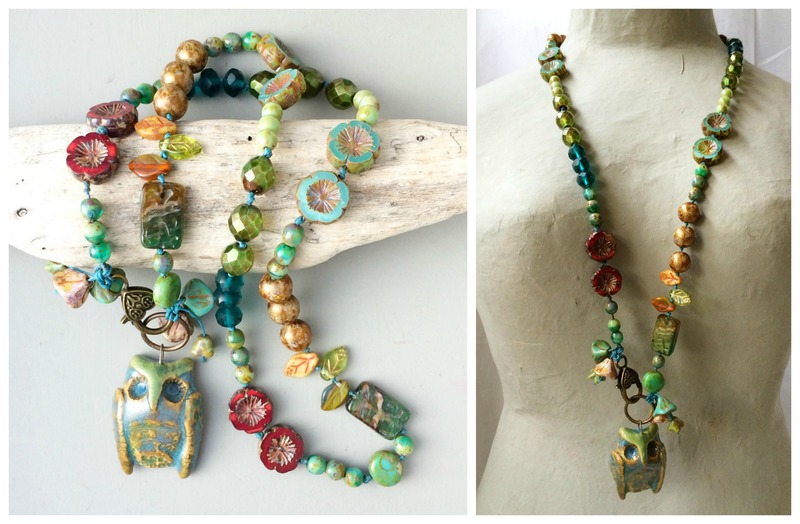 These two ceramic artists are among my very favourites, and both of them keep tempting me with more and more lovely beads, which they sell through various groups on Facebook including Australian Art Beads, Handmade Alchemy and Handmade Beads and Findings, among others. I added several lengths of sari silk in colours that and a selection of Czech beads in different sizes and shapes in coordinating hues. Finally, there is also a brass dragonfly clasp that is similar to one I received in my very first bead soup! I hope you really enjoy playing with this soup Denise, I had fun putting it together for you! Ok, so now we both have until 25 March to create with our bead soups. I’d better get cracking! This month’s book for the Inspired by Reading Book Club was the delightful novel A Girl of the Limberlost by Gene Stratton-Porter, an American naturalist and novelist who lived by the Limberlost Swamp in Indiana. The story is about a girl who lives by the Limberlost Swamp. Elnora is determined to go to high school in the nearby town, despite her mother’s resistance, and pays her way through school by catching and hatching moths for collectors. The book mentions a variety of moth species, in particular the beautiful and coveted Luna and Yellow Imperial moths. I was fascinated by the descriptions of the moths emerging from their cocoons and fluttering their wings to dry them out and extend them for flight. I really enjoyed the book, in fact I couldn’t put it down (luckily I was on holidays and had time to read). Elnora was a feisty heroine, who reminded me a lot of Beth from Little Women and Anne from Anne of Green Gables—independent and smart. And the author’s love of the Limberlost Swamp and its surrounds was evident throughout the book, which is rich in images and details of the swamp and its wildlife, especially the moths. After reading the book, I knew that what I made would have to feature a moth or butterfly of some kind. Luckily I had the perfect specimen to hand—a delightful enameled moth (well maybe it’s a butterfly but I’m calling it a moth) by Anne Gardanne, which I picked up at BeadFest last year. Although I’m not sure it resembles any of the Limberlost moths, it is a sweet little focal in turquoise with mauve undertones. It seemed appropriate to put cocoons alongside the moth. I used Heather Power‘s method for making wrapped wire and silk beads (as outlined in her recent book Beautiful Elements) and a piece of frayed mauve and blue sari silk to make two cocoons. A few flowers and a dragonfly clasp—because all swamps have dragonflies!—and it was done. Thanks Andrew and the rest of the Inspired by Reading book club! I’m looking forward to the next book on the list. And you can see some of the pieces made by others in the book club’s Facebook group. Or rather, that was Halloween! Blink and you miss things these days! Well, in our case, a horde of children descended on our house to go trick or treating in our neighbourhood (how nice that it was a Saturday night! ), that’s my excuse anyway. But I thought I would show you a few scary bits and pieces that I celebrated the season with! I took part in a Halloween jewellery swap. My partner and I had to make each other some Halloween jewellery. I had actually ordered a rather snazzy lampwork sugar skull focal just before I went away on my big adventure, but sadly it didn’t survive the trip in the post (which was literally just across town), so the artist, Pauline Delaney, kindly offered to make me a new one. Complicating it all was the fact that the first skull was sent in good time for me to receive it before I left on holiday but then took more than a week to travel across town (happily Pauline is local). So I didn’t find out until I got back from my trip, and then it took a little while for Pauline to make and send the replacement. Anyway. It all got sorted nicely and my skull arrived in the mail. The next challenge was to work out what to do with it. I have to admit to having a bit of designers’ block on what to do. I pulled out lots of beads but couldn’t come up with something I liked. So I turned to Pinterest and went looking for inspiration. And what do you know! I found it! After seeing some skull beads (mostly in earrings I admit) with tasselled skirts, I played around and came up with a sari silk tassel to match the flowers on the back of the skull, flowing from a Fallen Angel Brass black tulip bead cap. The accompanying beads went into a wire wrapped necklace along with a few Czech glass flowers, and Vintaj Arte Metal chain. 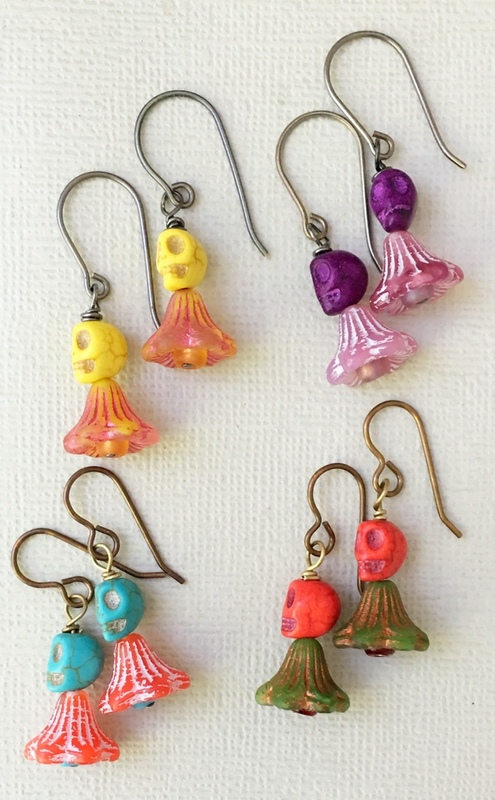 While I was in the mood for skulls, I also put together a few pairs of cute earrings, featuring some tiny dyed howlite skulls with floral skirts. A pair of these plus the necklace went off in the mail to my swap partner Janeen, who lives in California. And on Monday, Dia de los Muertos, aka Day of the Dead (the Mexican holiday which celebrates and honours the dead), I received a marvellous necklace and earrings from Janeen (she received her package that day too!). 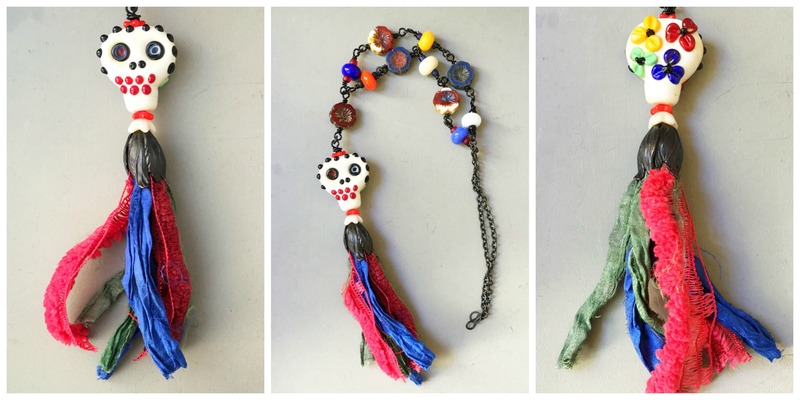 The necklace she sent me features polymer clay skulls by Staci Louise Smith, and I love it! Thanks again Janeen! Along with the classes, BeadFest has a huge expo hall full of bead sellers—everything from tables covered with semi-precious gems to small artisan beadmakers (those were my favourites). 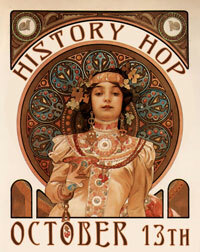 The expo was at least 10 times bigger than the Aussie bead shows (makes sense – the population in the US is a bit more than 10 times that in Australia too) and I spent hours there (and lots of money too). I didn’t buy much in the way of semi-precious stones, as (a) I don’t use them all that often and (b) I can get a lot of them in Australia for much the same price. 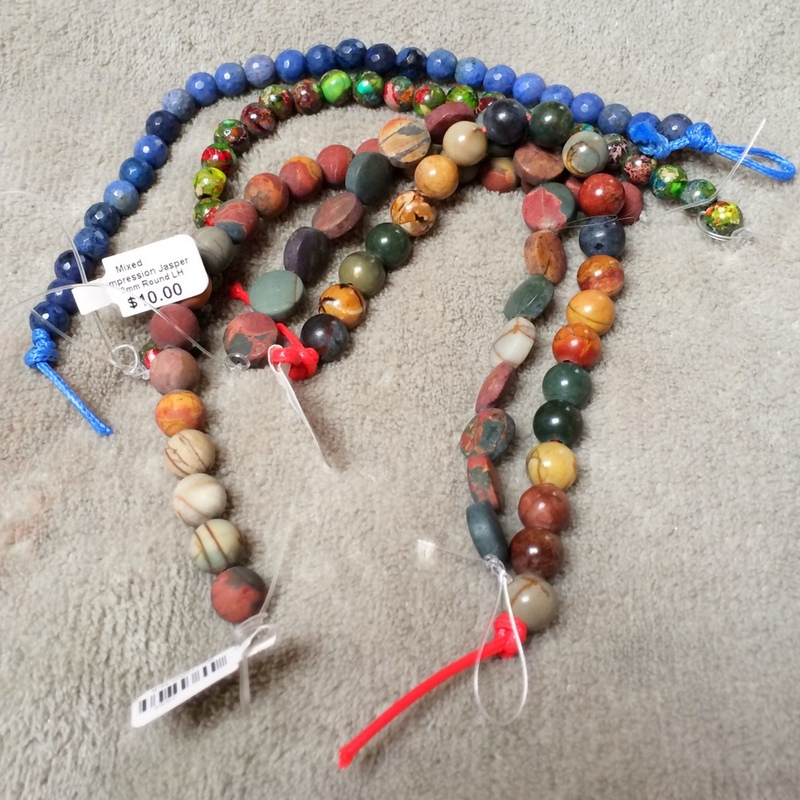 But I did get a few strands of large-holed beads and some nice matte-finish red creek jasper. The blue is dumortierite and the one below it is impression jasper. These were all from Dakota Stones. It was nice to look at all the tools available (except I could never get a look-in on the Lindstrom pliers, oh well, kind of out of my price range anyway). I tried out the Xuron pliers and the Wubbers, and liked the former more than the latter, but found them on Amazon cheaper than at the show. I looked longingly at Brenda Schweder’s Now That’s a Jig, but right now I don’t do enough wire-wrapping to justify the US$200 pricetag. I did buy some Impressart stamps as they had a buy 5, get a 6th for free deal. 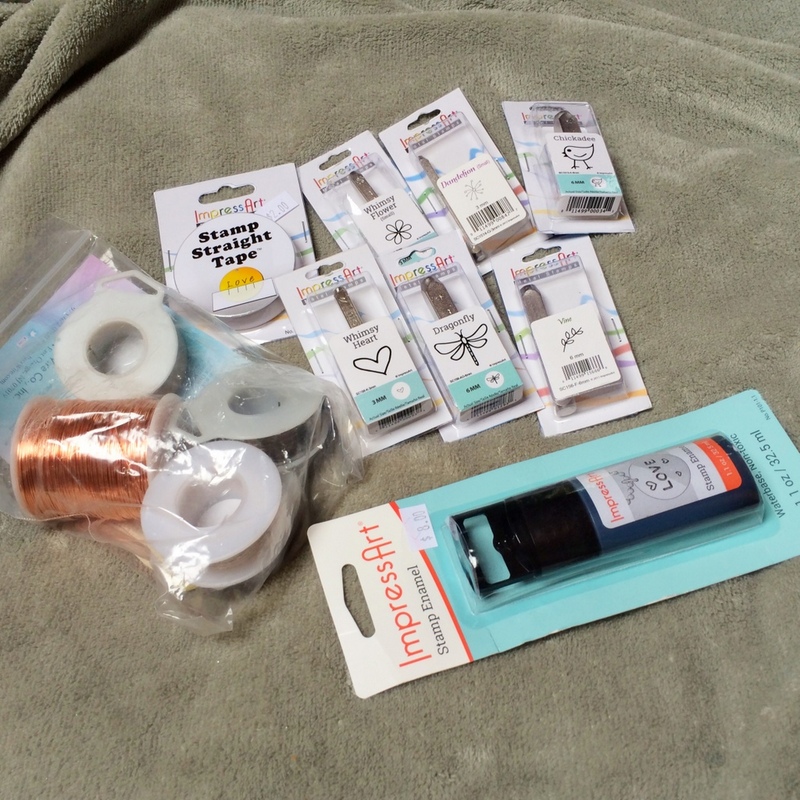 Speaking of wire, I bought some of that too—it can actually be quite expensive here and I use quite a bit of it. I was a bit disappointed that there were not more high quality components there – companies like Vintaj, TierraCast and Nunn. I think a few sellers had bits and pieces but that was about all. Probably a good thing for my bank account though! 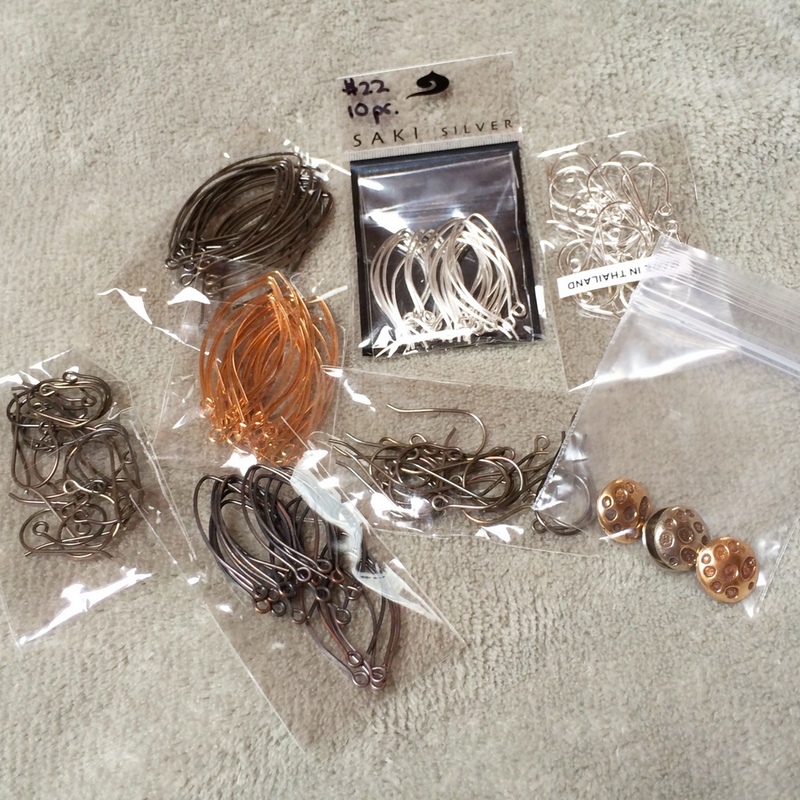 But then I discovered Saki Silver and I got some great earwires in silver as well as copper (both antiqued and not), and some buttons too. The Bead Goes On had some great Indonesian seed beads and some lovely Thai copper (and silver too, but I didn’t buy any of that). I got some nice sari silk in bright colours I haven’t seen before from Fiber and Beads. Some seed bead blends in my favourite 6/0 size beads. 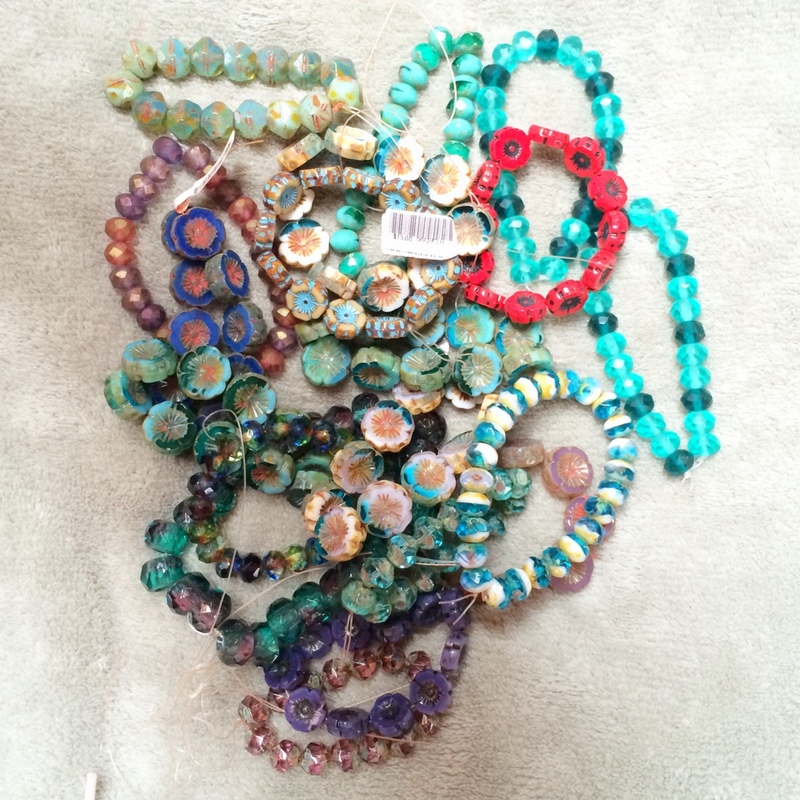 And I stocked up on some of my favourite styles of Czech glass beads at Nirvana Beads. I think my mind is turning toward summer as I seem to be drawn to the blues at the moment. 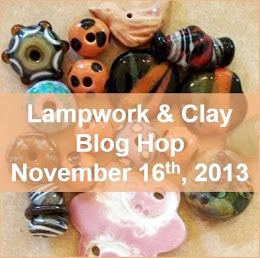 I’ll talk about the art beads in the next post. 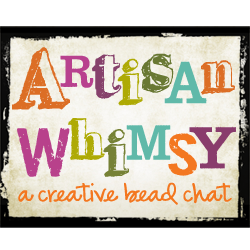 One of the Facebook groups I follow—Artisan Component Marketplace—recently held a contest for jewellery designers. The brief? To design a piece of jewellery using a component from one of the many artisans who are members of the group. 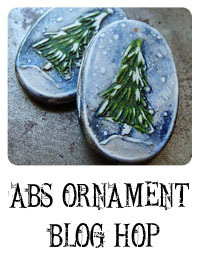 I happened to have a pair of polymer clay “sinkers” made by Kristi Bowman languishing in my stash, and this challenge was the perfect opportunity to use them. I chose a couple of Czech glass table cut flowers and wired them together, and wrapped the join between them with sari silk, inspired by the creative ways Kristi Bowman uses sari silk in her own designs. The dangles are hung from a pair of Rebecca Anderson‘s Deco Rose earwires in antiqued sterling silver to make a sweet pair of earrings. 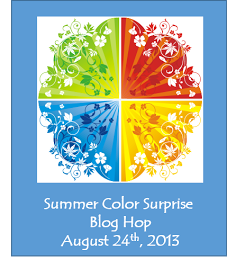 Much to my surprise, I won second place in the contest! Thank you to Artisan Component Marketplace, the judging panel and to Kristi Bowman for the delightful sinkers, and the inspiration! And I’m looking forward to receiving some new components from Kristi, courtesy of the $25 gift voucher I won! 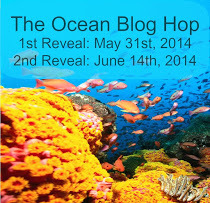 First up, I’m sorry I’m a bit late to the Ocean Blog Hop, a combination of busy times at home and some struggles with the muse mean I’m late to the party. Well, better late than never. Of course, there shouldn’t really be a need for excuses, as Lisa Lodge, the host of the hop, sent these beads out months ago. Look at what she sent me! 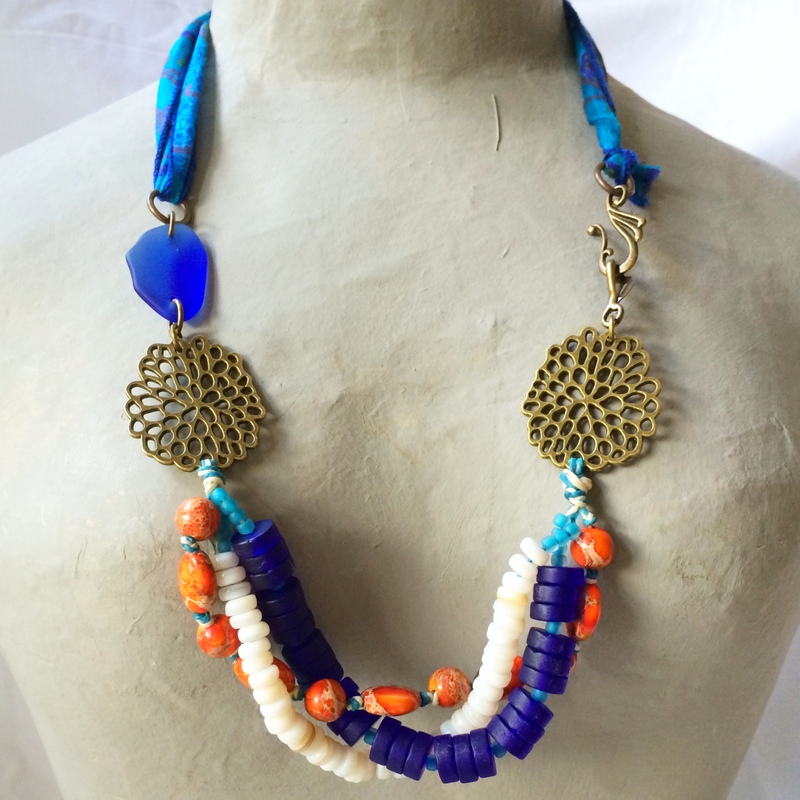 Cultured (aka faux) sea glass in two shades of blue as well as orange, vibrant orange impression jasper, tiny mother of pearl heishi and some brass starfish, fabulous stampings that look like coral and some tiny brass beads and a clasp! So the first piece I made I’ve called Washed Up. It uses some of the irregular sea glass links and the orange beads. I wanted to use an art bead in this piece and I found a great ceramic shell link made by Michelle McCarthy of Firefly Designs, that I think I got in a destash from Lisa a while ago. I tried to use brass link the beads together, but the holes in the sea glass weren’t quite in the right places to hold a jump ring, so I ended up using waxed linen, which kind of reminds me of rope or fishermen’s nets on the beach. I added some barrel-shaped sea glass beads in a lighter blue (that I also got from Lisa) and some orange sea glass rounds. 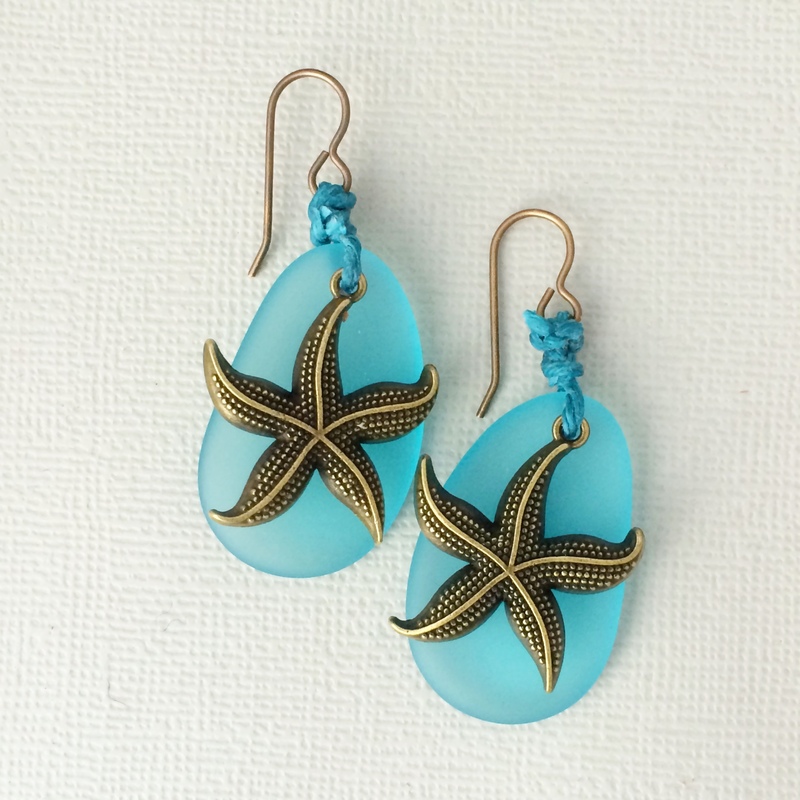 Then I made some earrings using the brass starfish, and some large aqua blue sea glass charms I got from Lisa a while ago. Very simple, but they didn’t really need anything else! My third piece is a necklace, although it started out as a bracelet! I’ve called it Out on the Reef. The brain coral stampings are used to connect a little twisted strand of beads. 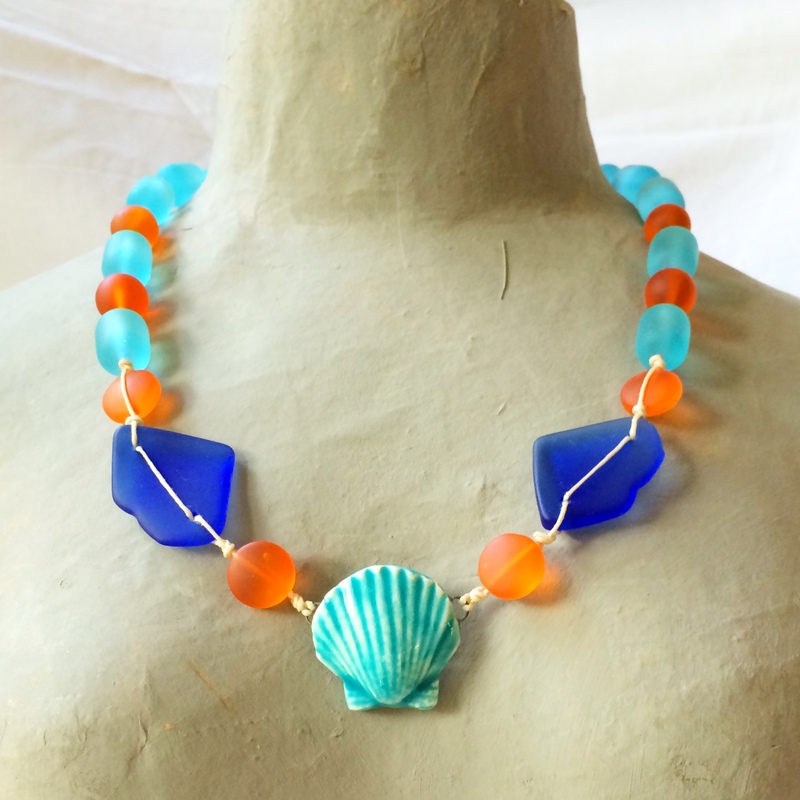 The mother of pearl heishi beads remind me so much of those shell necklaces I used to wear as a kid, and I love the contrast of the deep blue glass and the orange impression jasper. I toyed with using chain for the back half of the necklace, but in the end I used a gorgeous blue sari silk ribbon (from Etsy shop Ribbons and Silk). The blue sea glass shard on one side balances the clasp on the other side. Thank you Lisa for the lovely selection of beads to play with, I’m looking forward to the next hop in a couple of months! 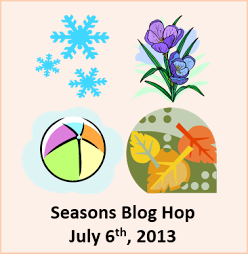 Please take some time to look at the blogs of other participants in this hop! 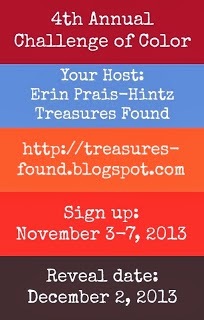 Melissa Trudinger, Bead Recipes <– YOU ARE HERE! 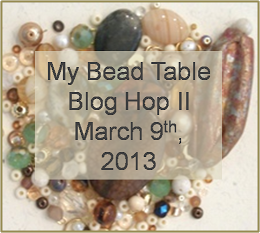 Owls and dragonflies: the 8th Bead Soup Blog Party reveal is here! 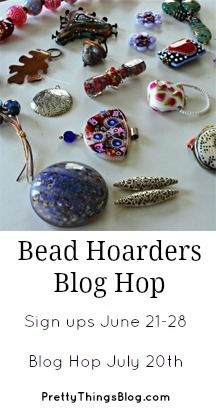 So here we are again, at the 8th Bead Soup Blog Party, the highlight of the blogging beader’s calendar! 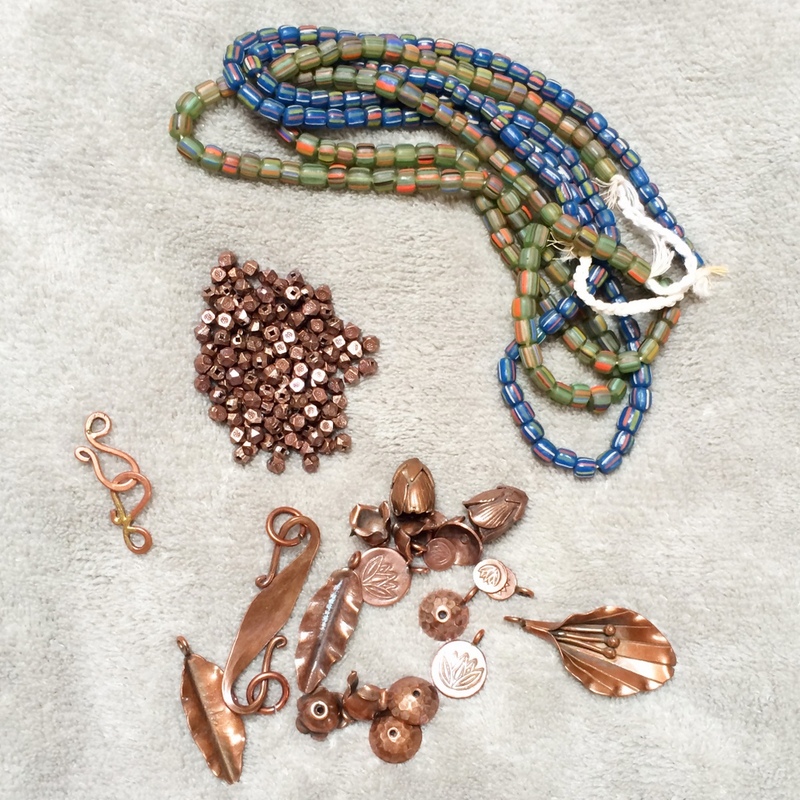 The premise is simple, participants are paired up by our amazing host Lori Anderson to swap a bead soup containing at the minimum a focal and a clasp, plus some coordinating beads. 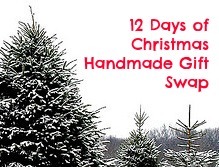 This year almost 500 beaders and jewellery designers from around the world signed up to play. 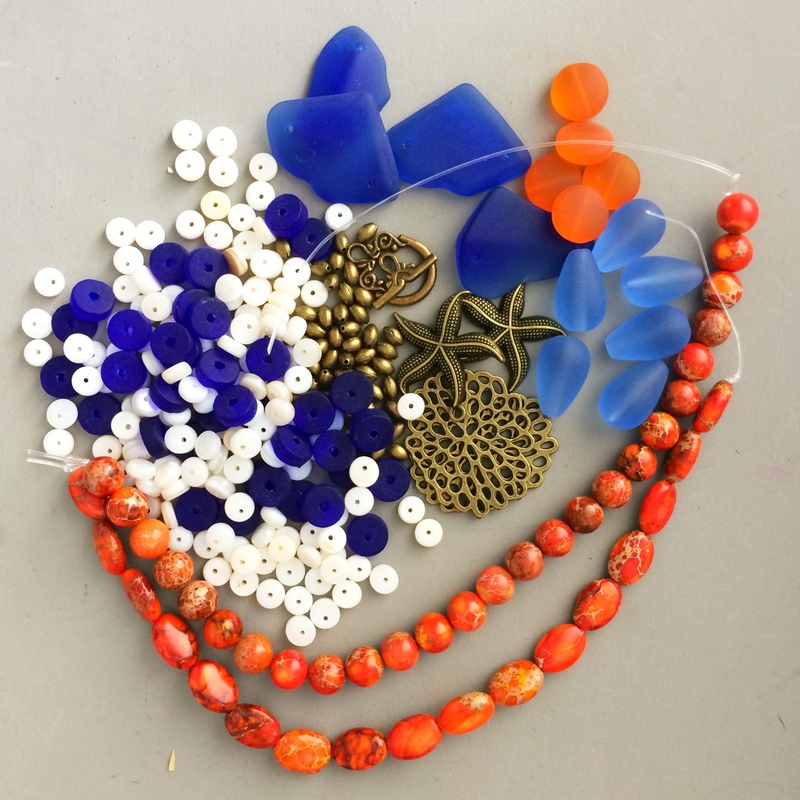 Today we reveal what we made using the beads our partners sent us. My partner, Sandra Wollberg, from Wiesbaden, Germany (you can read more about her here), sent me a fabulous soup, including a pendant, clasp and bracelet bar from Blu Mudd, handmade polymer clay headpins, a stunning Czech glass button and a selection of beads including Czech glass dragonflies, flowers, leaves and little critters, freshwater pearls and some painted shell beads, Indian glass, and peanut beads. There was also some sari silk and a packet of mica sheets, thrown in by Sandra as an extra challenge. 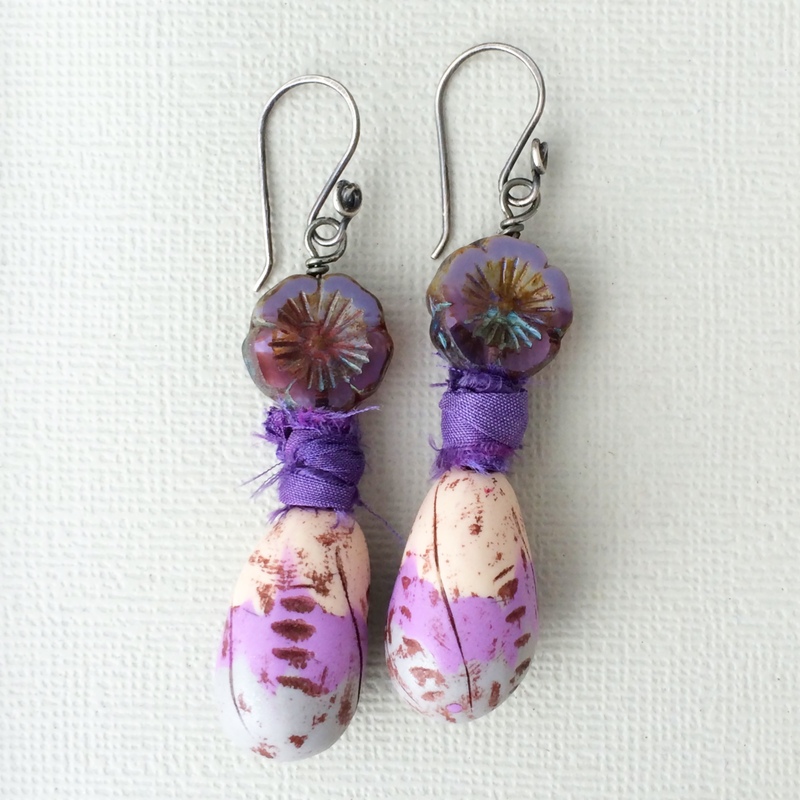 To get my muse going, I started with a few pairs of earrings, using Sandra’s polymer clay headpins, one pair wrapped with the pretty painted shell beads, the other one combined with two little ladybird beads from the strand of Czech glass critters. A third pair of earrings became a posy of Czech glass flowers. Next on the list was the bracelet bar. I had it in mind to combine it with leather, and I found some lovely soft teal blue leather that picked up the blue colour in the flowers embossed on the bar. 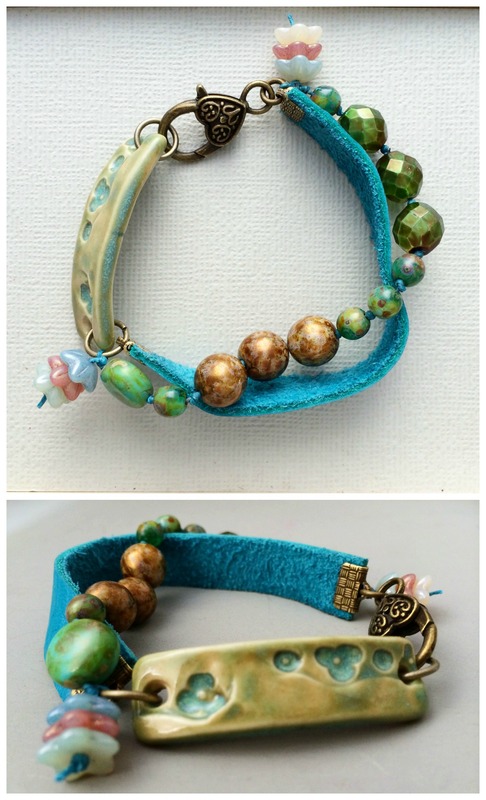 To counter its one-sided weight, I knotted a selection of beads onto some teal blue waxed linen. 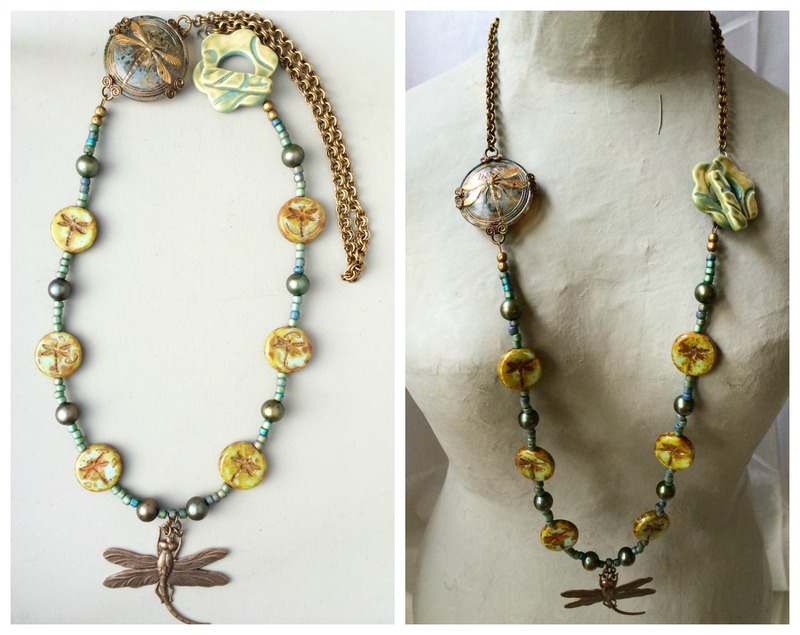 My first necklace was inspired by the dragonfly beads and the Czech glass button, which also features a dragonfly. The challenge for me in this piece was to work out how to incorporate the button into a necklace,, especially as I also wanted to use the clasp Sandra sent me. In the end, I cut off the button shank and used a filigree piece from Vintaj to wrap around the back of the button, with a couple of jump rings to create a link. Between the button link and the clasp, I strung the Czech glass dragonfly coins and the pearls, and used a Vintaj dragonfly as a pendant. I’ve called this necklace the Dragonfly Pond necklace. And finally, a necklace with the Blu Mudd owl pendant. The pendant is glazed in a glossy gold with breakthrough undertones tones of teal and green. I was inspired by some of Lorelei Eurto‘s recent necklaces, with beads knotted on linen, so I picked out a selection of beads in blues, greens and bronze shades, as well as a deep red to give a pop of colour, from both the bead soup Sandra provided as well as my own stash and knotted them on teal blue waxed linen (you’ll recognize some of the beads from the bracelet). The pattern repeats linearly from the clasp to the pendant, but looks asymmetric—a trick I think I picked up from one of the posts in Love My Art Jewelry‘s recent bootcamp on asymmetry. I’m really pleased with how this necklace turned out, I think it really captures the autumn woodland feel of Sandra’s soup. I’ve called it the Owl in the Woods necklace, and I think I’ll keep it for myself! Now, there are a few elements from my soup that I haven’t yet used. The Indian glass beads are destined for a necklace when I find the right chain. I almost used the peanut beads in the dragonfly necklace, but the seed beads just looked better. And I plan to make a few more pairs of earrings as well. 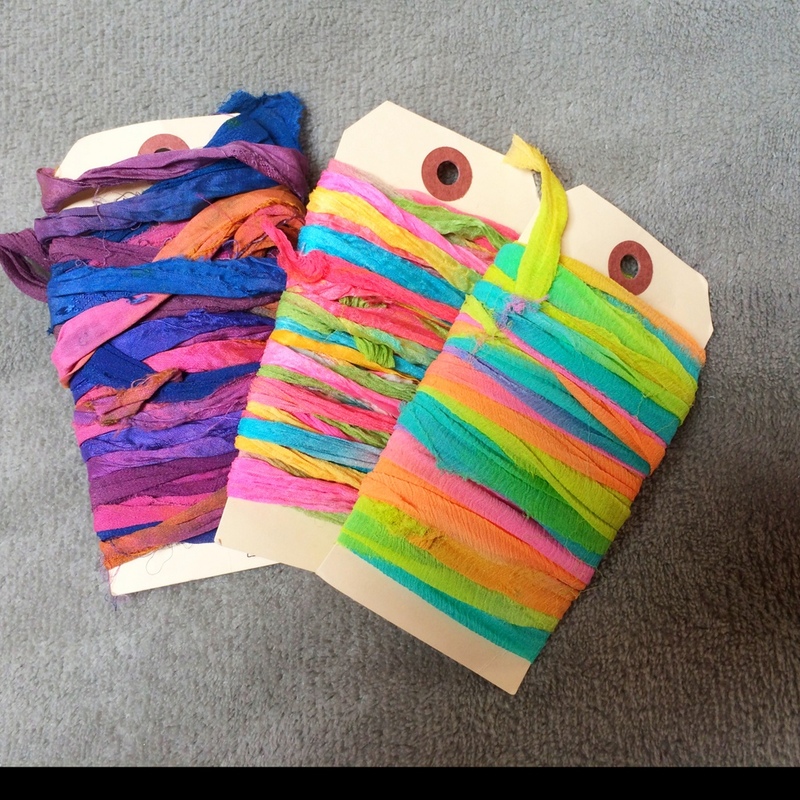 The sari silk is lovely and I’m sure I will use that somewhere soon. The mica sheets are a bit more challenging, and I’ve been looking at various tutorials and blog posts about how to use. I have had them out to play with but so far I haven’t actually done anything. I have plans though, which I am sure I will blog about down the road. Thank you Lori, for once again throwing a wonderful party with fabulous guests, despite your own personal challenges besetting you at every turn! I’m already looking forward to whatever you dream up for next year’s party! And thank you Sandra for a fabulous soup, which stretched me as a jewellery designer. I hope you had as good a time playing with my soup as I did with yours! 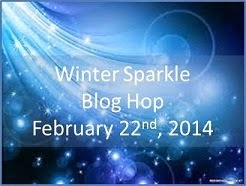 Now, I have the daunting but enjoyable task of visiting as many of the other blogs partying with me as I can. To see what Sandra made with the soup I sent her, visit her blog. 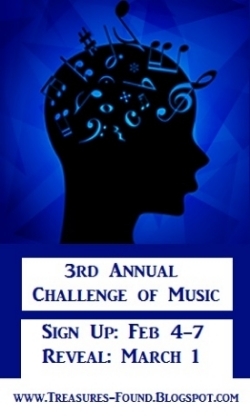 And for the full list of participants, go to the main BSBP page.